Last Saturday was the first year anniversary of my little space on the blogsphere. First and foremost I thank almighty who blessed me with such a wonderful family, friends and my dear readers who supported me on my journey of culinary. Without your immense support, I wouldn't have made it so far. I look forward for your continuous support and your suggestions, comments and reviews; all really matters to me. So please don't shy away from jotting down your suggestions and comments. In my previous post, I had mentioned about a Keralite festival named Onam that we celebrate here in US too. We had a function on the weekend to celebrate Onam. It was a mere coincidence that I and my friend decided to put up a stall during the function and it happened to occur on the same day as the blog anniversary. There was lots of baking, canning and packaging happened over the last few days, but I am happy to say that none of my effort went in vain. We were little skeptical in the beginning, but things turned out to be very well and we got lots of positive comments. Unfortunately I didn't get time to take any snaps of the goodies I made. Oh well, that happens I guess...but no regrets. Heartfelt thanks goes to Shema from lifescoops who was there to help us with banner and setting up the table. It was quite a bit of experience.. I am sharing a picture someone took during the function. Ok, let me come back to today's post. 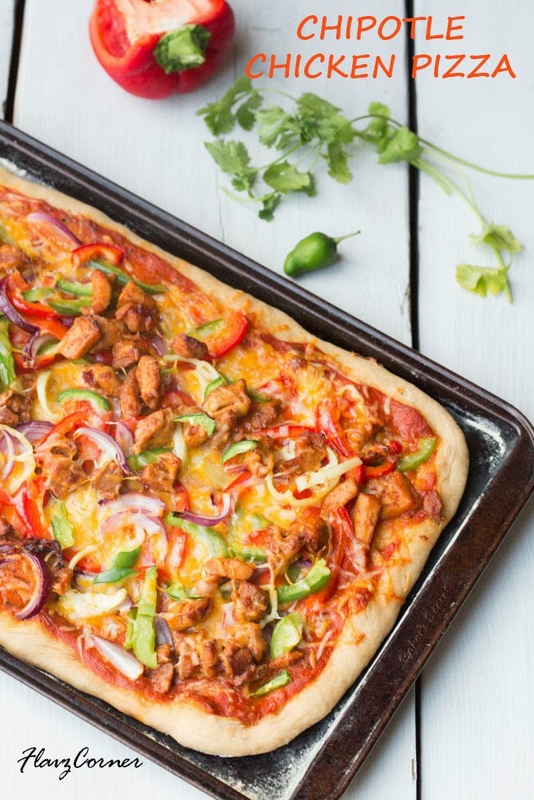 Mexican flavors are well received by my family and when the flavors are combined into a pizza, it’s an ultimate panacea for a dinner dilemma when one asks for pizza and other for tacos. I had been making this pizza for last 2 yrs and it’s an absolute keeper for anyone who loves Chipotle flavors. Mix 1 packet or 1 1/2 tsp of active dry yeast and 1 tsp of sugar with 1/4 cup of luke warm water and keep it aside for 10 minutes or till it is frothy. Knead the wheat flour, all purpose flour, yeast mix, salt and 1 1/2 cup of water to form a elastic dough. The dough might be sticky. Add 1 tsp of olive oil to coat the top of the dough. Cover and leave it to rise for 1 hr. In a non stick pan, roast the crushed garlic with 1 tsp Olive oil till golden brown. Add the Cilantro leaves and the tomato sauce. Adjust the salt. Warm till it starts to boil. Turn off the burner and keep it aside. Mix the vegetables with Olive Oil and sea salt and keep it aside. Heat a non stick pan and add 1 tsp of Olive oil and cook the minced garlic till golden brown. Now add the peprika powder and chicken and mix well. Add chipotle marinade and chopped chipotle chili. Adjust the salt; cover and cook till all the water dries up and the chicken is thoroughly cooked. Turn off the burner. Pre heat oven to 415 °F. Punch down the pizza dough and divide it into 2 balls. Roll the dough into a thin crust pizzas on a floured surface. Dust a pizza pan with wheat flour and transfer the rolled dough into the pan. Spread 1 cup of sauce on the pizza crust. Apply olive oil on the sides and sprinkle sea salt. Add 1/2 cup of cheese blend over the sauce. Now evenly distribute 1 cup of vegetable mix over the pizza. Spread half of the chicken above the vegetable mix. Sprinkle 1/2 cup of the cheese over the chicken and bake the pizza to 20 minutes. Make the second pizza with rest of the dough by repeating the steps 3 and 4. Adjust the chipotle chili in adobo sauce according to your spice level. They are pretty hot. I add only a very small amount for kids. You can get the chipotle peppers in adobo sauce and marinade from Walmart or any grocery stores. I used the homemade tomato basil sauce. Don't skip the step to season the sauce with roasted garlic and cilantro. It gives a good flavor to the pizza. Looks Delicious, Thanks for helping create my family’s dinner tonight! Btw, some of the marinade and sauces u have mentioned, do u recommend any particular brand? Thanks Manju!!! 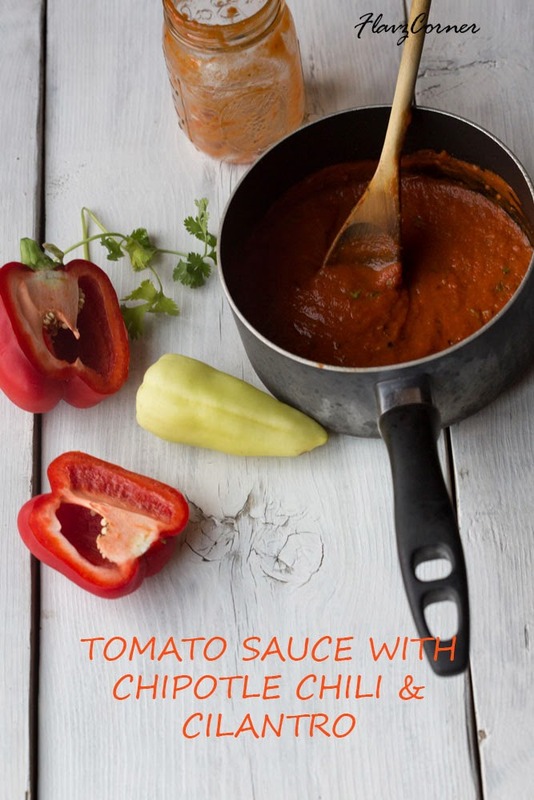 I had updated the post with the brands I used for the sauce and marinade. 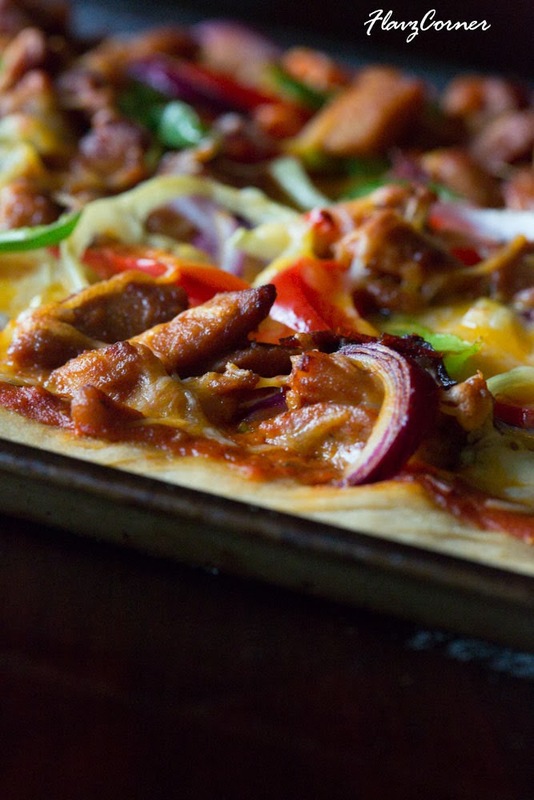 The smoky Chipotle flavors are the best part of this pizza. Increase the number of peppers per your taste by just tasting it before adding to the sauce and chicken. Oh, so my first comment did come through eh!! I thought it dint , so typed it out again...anyways never mind ;-) Thanks for updating the brands, will see if I can get them here. We love your recipes, they are so yummy. Would be delighted if you can share your recipes with us at http://ipinrecipes.com/ A Community for food bloggers and food lovers. Simply register your food blog with us and start pinning your recipes directly from your blog. No need to crop or edit your images and your recipes will be published immediately without any editorial review. With ipinrecipes.com you can, not only pin your recipes, but you can repin, like others recipes and can create food category boards.